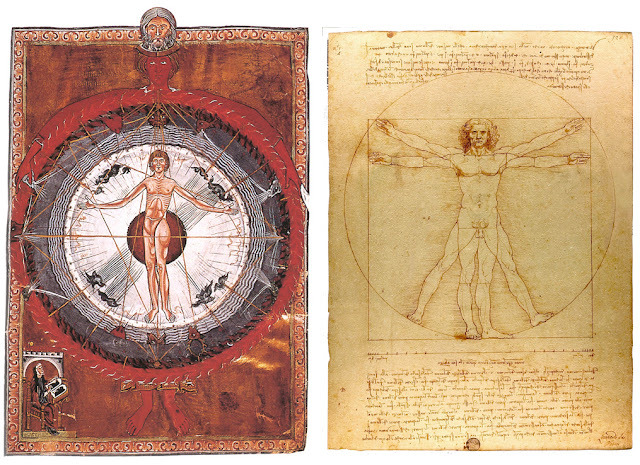 Leonardo da Vinci's Vitruvian Man is one of the most famous images in the history of Western art. It captures Leonardo's melding of art and science, which was central to Renaissance rationalist humanism. It also harks back to a Classical source: Vitruvius's essay on architecture, which laid out a canon of ideal proportions for both buildings and human beings. Thus, the picture also embodies Classical perfectionism--a theme that resonates now with our endless efforts to achieve perfect beauty. But Leonardo's picture was not the first image of idealized proportions in Western art. 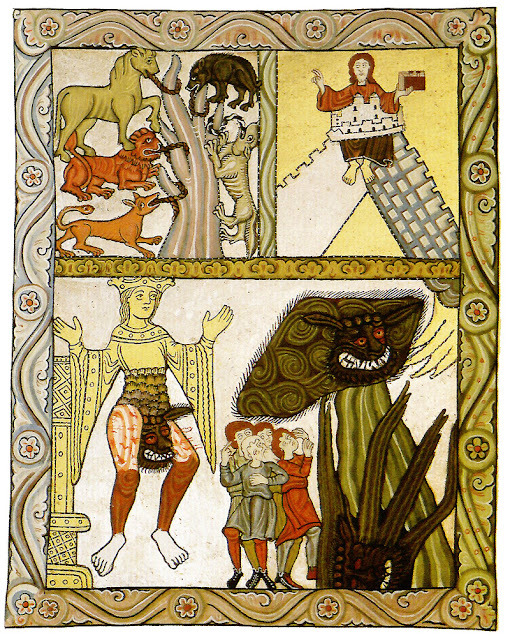 A striking comparison case can be found an image by Hildegard of Bingen (top left). Yes, Hildegard. 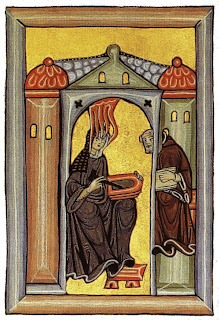 Born in 1098, at a time in which woman were removed from intellectual and creative life, St. Hildegard was a composer, poet, philosopher, mystic, linguistic, botanist, and medical theorist. Last October, the Pope announced that she will be named the 35th "Doctor of the Church," an honor she shares with Augustine, Anselm, and Aquinas. In short, St Hildegard was a Renaissance man, though she was neither a man nor alive during the Renaissance. She died in 1179, nearly a hundred years before the birth of Giotto. Leonardo's Vitruvian man was drawn more than 300 years later (c. 1490). Before getting too excited, however, about how St. Hildegard anticipated the Renaissance, it is important to remember that she is a medieval figure. It would be a distortion, clouding her own unique contributions, to paint her as a modern before the modern era. St. Hildregard was no rationalist. Born to a wealthy family and given to the Church, she began having visions at the age of 3. Her "Universal Man" appears in one of the three volumes on her visions, which she wrote and illustrated. 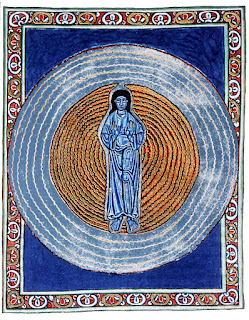 She saw a series of concentric circles, including circles of air, ether, fire, and clouds, and then a body appeared at the center. The body is proportioned as perfectly as Leonardo's (when superimposed, they are strikingly similar), and it also represents an ideal of perfection, but it is neither Classical nor scientific. This is a cosmological body, or, more accurately, the human form as a microcosm of a supernatural cosmos, whose truths are disclosed through revelation. 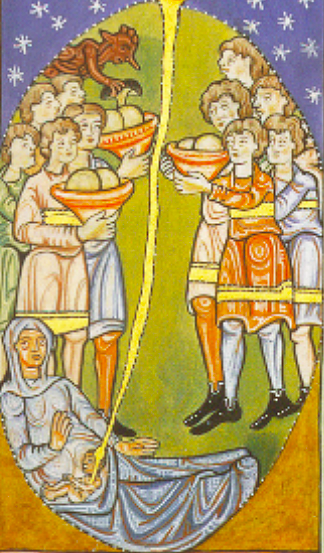 Visions are gorgeously illustrated throughout St. Hildegard's manuscripts. Even her versions of biblical stories take on surprising new forms, at a time when there were strict canons for the depiction of sacred texts. For example, the second image above represents the fall--the dark form is the serpent, I believe, and the stars on the right represent Eve. 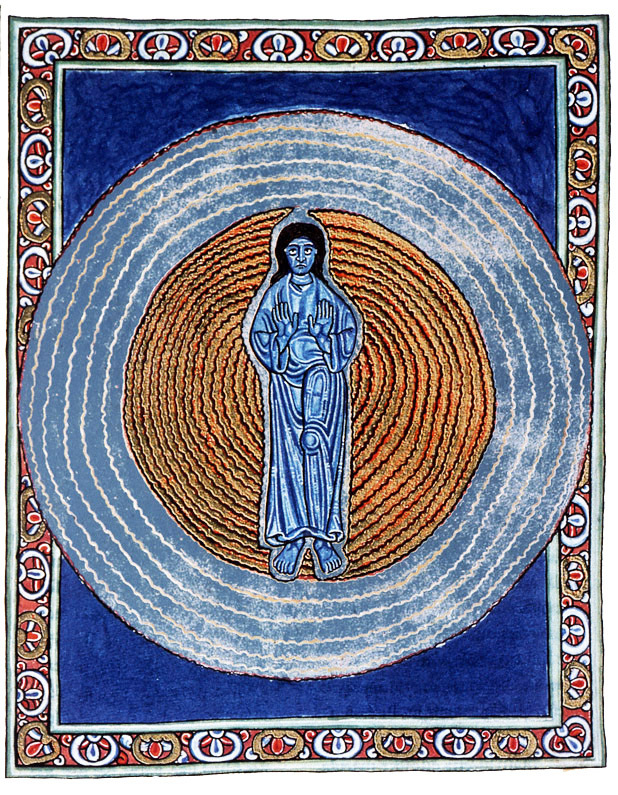 The next image, with two concentric circles and an androgynous blue figure in the center, represents the trinity. In the two after that, we see Hildegard herself, experiencing visions. The most striking vision in St. Hildegard's work may be the one reproduced below. The panel on the top left represents five upcoming eras of the the world. Each is symbolized by an animal: a horse, a lion, a dog, a pig, and a wolf. Their long rope-like tongues wrap around the trunk of a tree. On the right, we see a Christ figure suspended in what looks like a castle--perhaps the Kingdom of heaven. 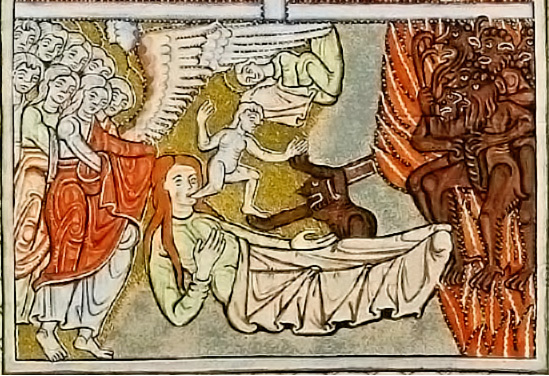 The lower panel depicts the Antichrist, who has come to attack the Church. The Church is personified as a woman. The face of the Antichrist has been planted on her loins, as if he has succeeded in taking her purity. Parishioners cower below. There is hope, however. Yellow lightening bolts are showering down on the Antichrist. Perhaps his victory will be short lived. 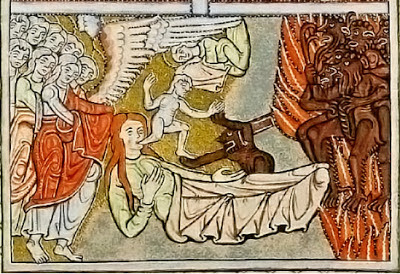 The menace of Satan pervades St. Hildegard's work. In the image on the left, we see a devil making mischief in the corner, and in the image above a flock of demons stand poised to wage war against an army of angels. One can only imagine the anxieties that tormented people living in a time when it was widely believed that the world is a stage for a holy war between good and evil. Renaissance rationalism rid us of this anxious worldview, but it isn't obvious that this led to an improvement in art. For me, Hildegard's nightmarish visions are more satisfying than the cool Classicism in Leonardo's Vitruvian man. Though hardly a household name, she is certainly among the most interesting figures in the history of Western art.